Stoke College is set to run Saturday Courses, and one of these will be a “Certificate in Business Start-Up” (P1452). This is set to run on Saturdays from 9am-1pm at the Cauldon Campus, from 5th March 2011. Cost: £370. Interested? Please ring 01782 603675 or 01782 603642 for more details. Staffordshire University Library is now offering a corporate membership scheme. Also notable is that members of the Workers’ Education Association can now join the library for free. The Stoke-on-Trent Film Theatre is set to premiere a new documentary film by Inspired Film & Video, Staffordshire Writers. The film looks at major writers from Staffordshire and Stoke-on-Trent, ranging from Doctor Johnson and Arnold Bennett through to Arthur Berry. The date is 2nd February 2011, at 7.45pm. 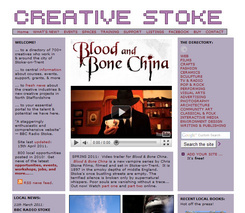 The Stoke Your Fires film and animation festival programme is now available in PDF format (800kb). Animators Tristan Pritchard and Eleanor Leadbetter will be in residence at the Potteries Museum & Art Gallery from 19th February 2011, with workshops at the venue for under 16s (26th Feb) and Over 16s (12th March). Oliver Nicholls is currently on secondment with Big Lottery Fund’s West Midlands team, helping with the ‘Big Local’ work. He wants to know of any hyperlocal blogs or blogging / social media surgeries serving Chell Heath & Fegg Hays in Stoke-on-Trent. Know any? Contact Oliver here. Birmingham’s Punch Records is offering between £500 and £3,000 for artists to present new work at its annual BASS Festival (British Arts and Street Sounds), to be held in Birmingham during June 2011. For 2011 the theme is ‘Revolution’, and BASS will commission creatives to make new music, dance, spoken word and theatre. There’s no “Birmingham only” in the details, so presumably it’s open to people throughout the West Midlands. Application deadline: 14th February 2011. Application forms and full details at the website.